Leader in industrial lighting, Larson Electronics LLC, release an LED Light Tower which directly replaces balloon light towers. This 640-watt unit includes four, 4-foot LED fixtures configured as a downward ‘X’ to replace balloon light heads. 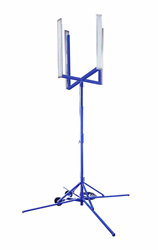 This LED light tower for is a highly efficient replacement for balloon light tower heads. The ‘X’ pattern helps diffuse the flood beam and reduces the possibility of blinding, making this a great fixture for elevated lighting at outdoor work sites. Leader in industrial lighting, Larson Electronics LLC, release an LED Light Tower which directly replaces balloon light towers. This 640-watt unit includes four, 4-foot LED fixtures configured as a downward ‘X’ to replace balloon light heads. This LED tower is mounted on an aluminum quadpod that reaches heights between 7 to 12 feet. This IP65 unit is an ideal high-quality lighting solution for public work sites and industrial operations. TThe WAL-QP-4X48.160W-LED-50 LED light tower kit from Larson Electronics is a suitable replacement for balloon light towers and consists of four, 4' LED fixtures with diffused illumination that are positioned downward and in an 'X' pattern, reducing the possibility of blinding. These lamps can be adjusted vertically and produce 76,800 lumens, drawing just 640 watts with a 50,000 hour- rated lifespan, making this unit highly efficient compared to conventional balloon light masts. This fixture has a 6,000K light temperature and illuminates the ground in a 160º wide flood beam spread of bright white LED light. The LEDs in the WAL-QP-4X48.160W-LED-50 are housed in aluminum and protected by shatter-resistant polycarbonate lenses. The quadpod the LED fixtures are mounted on has a telescoping center pole to raise the light heads 7 to 12 feet and is built with non-sparking aluminum for a durable IP65 rated assembly that can withstand harsh conditions and extreme temperatures from -30°C to +60°C. The LED light is equipped with 50 feet of 16/3 SOOW cord fitted with an industrial grade cord cap for easy connection to common outlets. This unit is multi-voltage capable and operates on 120-277V AC without modifications.